The Garlock G12 Generator was designed with flexibility and durability in mind. The G12 generators range from 0-12,000 watts of industrial power (continuous 10,500 watts). 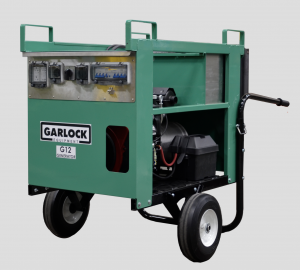 The generator features a Honda GX 630 engine and 32-amp breakers. With adjustable handles and four lift points doubling as overhead fork pockets for easier ground-to-rooftop transitions, this generator is designed to be adaptable for a variety of situations. According to the company, the unit features a robust frame with handles that fold in for easy transportation and storage. The “tip and go” design is balanced for easy rolling when lifted and automatically braking when set down. The wheel kits can be mounted inside or outside the frame to pass through doorways. A sound panel and wheel kit are optional.